The expansion allows Able to enhance the technology used in its repair and overhaul process and to diversify into new product and service offerings. 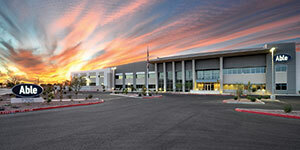 It is also expected to generate as many as 100 new skilled aerospace jobs over the next two years at the Mesa facility, where it operates as an industry-leading aircraft Component Repair and Overhaul (CRO) provider. From its purpose-built location, Able delivers more than 10,000 FAA-approved component repair, overhaul, parts and aircraft completion solutions for civilian and military, fixed- and rotor-wing operators in more than 60 countries. The Able Maintenance Center – located within the Able campus – delivers airframe repair and completion services, avionics upgrades and full paint services. All in-house work is completed by Able’s team of more than 450 highly trained mechanics, engineers, and customer service and sales specialists.